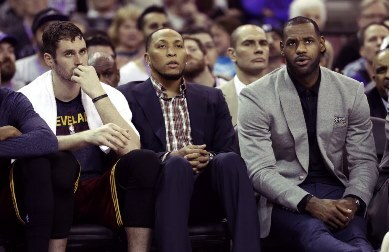 The Cavaliers are exactly halfway into their first season after trading the past two No. 1 overall picks in the NBA draft and another future first-round pick in exchange for Kevin Love. They are also 21-20, resting uncomfortably as the No. 6 seed in the mediocre Eastern Conference. Not much has gone according to plan, and Love’s play is among the things in question among Cavaliers fans and the national media. Did Cleveland make a colossal blunder in trading for Love? A recent ESPN.com Insider piece seems to think so. It’s headlined “Best trade fits for Kevin Love,” and yes, author Tom Haberstroh is entirely serious. It’s time to pick up the phone and see what you can get for Love. … He’s not a great fit on the roster, one with no rim protector. The coach obviously doesn’t trust him in late-game situations. If you don’t trade him, you run the risk of watching him walk for nothing this summer. You can’t afford to be stuck in that situation, and right now, the Cavs are going down that path. If things continue down this road, a Love deal has to be considered. The general manager’s job is to prepare for every scenario and look at the options. The author then outlines four trade possibilities — to Golden State, Oklahoma City, Phoenix and New Orleans. While Love would still fetch value in return, none of it would be as close to as good as what Minnesota appears to have in Andrew Wiggins. We have to imagine Cleveland actually trading Love is far-fetched. This isn’t just a one-year experiment, and there is plenty of time for the Cavs to figure things out. That said, the notion that this sort of thing is even being thrown out as a possibility speaks to how poorly this trade has worked out, so far, for Cleveland. RandBall: Is there a Packers and Vikings fan kinship?